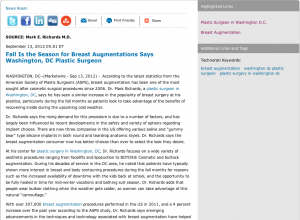 Washington, DC — According to the latest statistics from the American Society of Plastic Surgeons (ASPS), breast augmentation has been one of the most sought after cosmetic surgical procedures since 2006. Dr. Mark Richards, a plastic surgeon in Washington, DC, says he has seen a similar increase in the popularity of breast surgery at his practice, particularly during the fall months as patients look to take advantage of the benefits of recovering inside during the upcoming cold weather. Dr. Richards says the rising demand for this procedure is due to a number of factors, and has largely been influenced by recent developments in the safety and variety of options regarding implant choices. There are now three companies in the US offering various saline and “gummy bear” type silicone implants in both round and teardrop anatomic styles. Dr. Richards says the breast augmentation consumer now has better choices than ever to select the look they desire. With over 307,000 breast augmentation procedures performed in the US in 2011, and a 4 percent increase over the past year according to the ASPS study, Dr. Richards says emerging advancements in the techniques and technology associated with breast augmentation have helped more patients achieve improved self-esteem and proportionate figures. He notes that patients who are able to undergo the procedure in the fall and winter months have an easier time fully enjoying the pool and beach throughout the entire spring and summer seasons. “Breast augmentation in the cooler months is ideal as patients can heal without missing their time in the sun,” he says. Regardless of a patient’s timing of their cosmetic enhancement procedure, Dr. Richards urges all patients to consult with a board-certified plastic surgeon through the American Board of Plastic Surgery before seeking treatment. Through experienced and skilled hands, he says the extensive expertise of a dedicated practice can deliver a more confident body for any season. Dr. Mark Richards graduated with honors from Yale University and earned his medical degree from the University of Maryland School of Medicine. He then completed five years of residency training in general surgery and two years of residency in plastic surgery. After his training he became board-certified by the American Board of Surgery and the American Board of Plastic Surgery, and served as the President of the National Capital Society of Plastic Surgeons and the President of the Montgomery County Medical Society. Dr. Richards has been selected as “Top Doctor” in multiple surveys including the Consumer’s Research Council of America’s Guide to America’s Top Surgeons. He has been featured on TV and in national news articles. Located at 11300 Rockville Pike Suite 912 in N. Bethesda, MD, Ageless Impressions Plastic Surgery Institute can be reached at (301) 468-3458. The practice can also be contacted online via the website plastic-surgeon.us or at facebook.com/drmarkrichards.